We are proud of the landscape design and remodeling work we’ve done for our Northern Virginia clients, and we feel privileged to be able to share the praise they’ve given us over the years. "You've outdone yourself once again! We are so pleased with our new front and side walkways and patio, and the new landscaping and exterior lighting. The hardscape/landscape designs are both incredibly beautiful and functional. You clearly understood (even better than we did!) what was needed to create an inviting space to welcome our guests and for us to use and enjoy. It's as if we have added square footage to our home. We also want to compliment your craftsmen and their assistants for their diligence and reliability. The men who cut and installed the stonework worked extraordinarily hard and produced something truly beautiful. And, unlike most work produced today, we know that these results will last a very long time. Thanks again for giving us something so special." "We really love our veranda and patio fire pit, and have received compliments on these from everyone that visits us. The design is absolutely perfect for our yard and now we have a fantastic place for entertaining outdoors. Best wishes for the holidays!" - Dawn & Harry I. "Last summer my wife and I decided to add a cabana to our backyard. 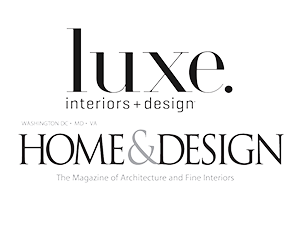 We interviewed eight different designers/firms and selected Berriz Design. What impressed us about Berriz Design was that Bob Berriz saw this not just as a construction of a cabana, but as a way to transform the entire backyard living space. His attention to detail and hands-on experience with all the related aspects of this kind of project —architecture, pool engineering, electrical, plumbing, carpentry, lighting, tiling, and landscaping—all came together beautifully. Berriz Design was not the least expensive quote we received, but it offered far and away the best value for our money. We got so much more than a cabana...we got a new outdoor way of life. Bob functioned like our partner, not just our contractor. We would challenge one another on what was possible and how to save money where we could, and regularly bounce ideas off one another. Bob understood that client satisfaction requires more than just "building to spec." It requires a real commitment to being flexible because in a job as complex as ours, you can't expect everything to go exactly as planned. His willingness to work with us—without "nickel-and-diming" us—was the mark of his professionalism and commitment. Bob: thank you for a job well done, and a backyard that we enjoy immensely. Please count us as a delighted client." "Thanks for everything. We love the room. We spent Christmas morning out there watching the snowflakes fall. It is so relaxing. Have a happy new year!" "We have just completed our second project with your company and could not be more pleased with the finished product. 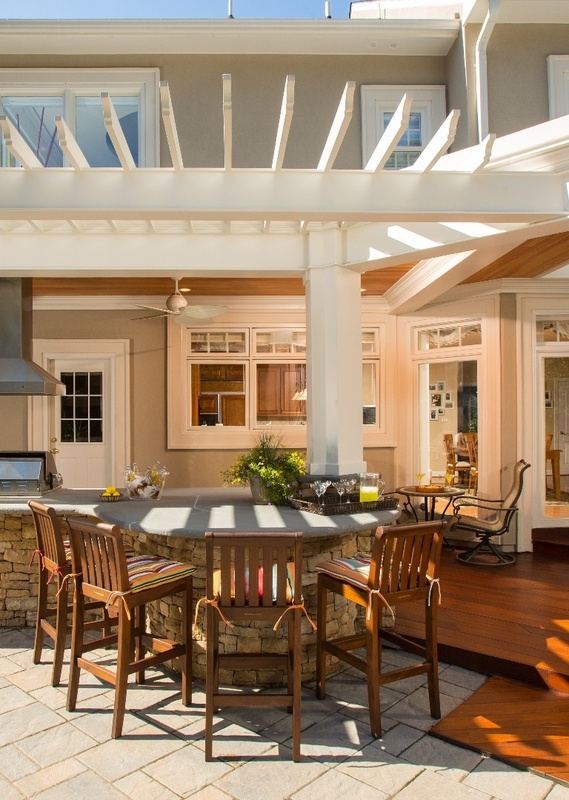 The first project Berriz Design executed for us was a big one: a screened porch, deck, and waterproof patio underneath. The porch is amazing and includes a gas fireplace with faux stone façade, custom ceiling treatment and removable screens. It also has a custom metal railing, recessed and cove lighting, beautiful Ipe wood and an interesting floor pattern. Next to it, the deck has a built-in grill with granite countertops, storage cabinets and a warming drawer for large crowds. The finishes in both spaces are exceptional because of the building materials selected and expertly installed. The patio below has a beautiful slate floor, recessed lighting, stained wood ceiling and three impressive columns, creating an open and inviting space. More recently, your company designed and carried off an amazing basement remodel. Our original semi-finished basement was somewhat of an afterthought, poorly finished, and non-functional. Berriz Design transformed this space into a gorgeous, highly functional living space for our family. Before, the stairs hugged a wall to enter the space. Now, the stairs turn and open into the newly-built bar area with granite countertops. A huge mirror hides a TV that is only visible when turned on—WOW. The bathroom is the nicest in the house; it boasts a seamless shower door and custom tiling with granite accents. The bedroom has a huge closet with custom rod placement and built-in shelving. The media area has an interesting ceiling treatment to hide unsightly ductwork as well as a feature wall to house the existing television. That room also boasts sconce lighting and cove lighting. Bob Berriz has consistently come up with creative design ideas to create and enhance our living spaces. We highly recommend this company for any remodeling project: basements, kitchens, porches, additions, and garage organization. Berriz Design is a one-stop contractor. We are very grateful for their beautiful work."